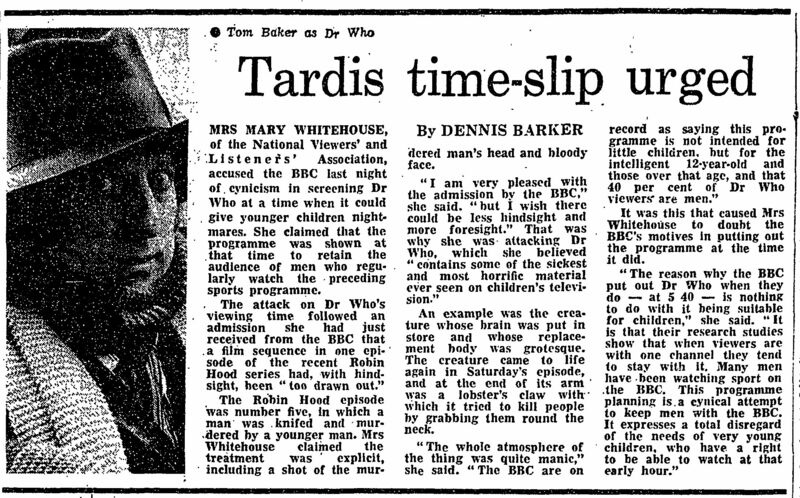 MRS MARY WHITEHOUSE, of the National Viewers' and Listeners' Association, accused the BBC last night of cynicism in screening Dr Who at a time when it could give younger children nightmares. She claimed that the programme was shown at that time to retain the audience of men who regularly watch the preceding sports programme. The attack on Dr Who's viewing time followed an admission she had just received from the BBC that a film sequence in one episode of the recent Robin Hood series had, with hindsight, been "too drawn out." The Robin Hood episode was number five, in which a man was knifed and murdered by a younger man. Mrs Whitehouse claimed the treatment was explicit, including a shot of the murdered man's head and bloody face. "I am very pleased with the admission by the BBC," she said. "but I wish there could be less hindsight and more foresight." That was why she was attacking Dr Who, which she believed "contains some of the sickest and most horrific material ever seen on children's television." An example was the creature whose brain was put in store and whose replacement body was grotesque. The creature came to life again in Saturday's episode, and at the end of its arm was a lobster's claw with which it tried to kill people by grabbing them round the neck. "The whole atmosphere of the thing was quite manic," she said. "The BBC are on record as saying this programme is not intended for little children, but for the intelligent 12-year-old and those over that age, and that 40 per cent of Dr Who viewers are men." It was this that caused Mrs Whitehouse to doubt the BBC's motives in putting out the programme at the time it did. "The reason why the BBC put out Dr Who when they do — at 5 40 — is nothing to do with it being suitable for children," she said. "It is that their research studies show that when viewers are with one channel they tend to stay with it. Many men have been watching sport on .the BBC. This programme planning is a cynical attempt to keep men with the BBC. It expresses a total disregard of the needs of very young children, who have a right to be able to watch at that early hour." APA 6th ed. : Barker, Dennis (1976-01-26). Tardis time-slip urged. The Guardian p. 5. MLA 7th ed. : Barker, Dennis. "Tardis time-slip urged." The Guardian [add city] 1976-01-26, 5. Print. Turabian: Barker, Dennis. "Tardis time-slip urged." The Guardian, 1976-01-26, section, 5 edition. This page was last modified on 20 November 2014, at 03:08.